The Reuben sandwich is the stuff legends are made of. Pictured is the Bowery Lane version. The great Reuben sandwich is defined by whatscookingamerica.net as a “grilled sandwich made with corned beef, Swiss cheese, sauerkraut and Russian dressing on rye bread”. But as for the history of the monumental sandwich that tradition dictates must be filled with both salt beef and dairy, it’s the stuff that legends – or at least legendary items of food – are made of. There are many claims and counter-claims surrounding the creation of the sandwich with the cult following: one of the most popular stories doing the rounds is that the first Reuben was created in 1906 at a deli on Park Avenue by German immigrant Arnold Reuben. Legend has it that the owner of the deli constructed the sandwich for an actress who came into Reuben’s Restaurant and Delicatessen in New York and demanded he make her a sandwich because she was “as hungry as a brick”. However, according to an article in The New York Times quoting Arthur Schwartz, author of New York City Food and blogger at The Food Maven, the sandwich thought to be a New York staple is believed to have been created in Omaha in the 1920s by wholesale grocer Reuben Kulakofsky who made the sandwich for his friends after a late-night poker game. 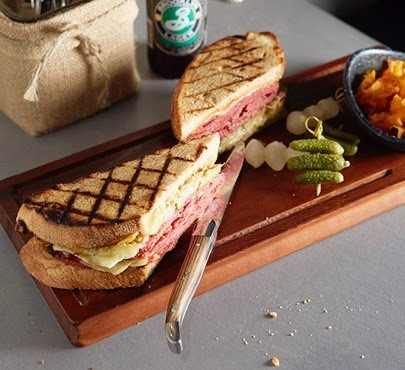 Regardless of the Reuben’s origins, the sandwich with superstar status has been on menus in Sydney for so long now that a celebration of it seems compulsory. What else is there to do but roll up your sleeves and enjoy? Coming soon: my round-up of great Reubens around Sydney. Subscribe to my website to receive links to my latest published stories.